This is a classic recycle job and I'm so tickled about how it turned out. The butterfly on this card was drawn by Sandi Huggett (Sandi's Samples) and was one of the freebie images offered on the original Creative Freebie Challenge over on The Outlawz. While that particular challenge went by the wayside a couple of years ago, I played in it very regularly and still have all the images which were done by Sandy and Anne Fenton. I was sorting out old cards I'd made way back when and which had been bent or otherwise damaged beyond repair. Several of them I tossed into a pile of "See if you can rescue anything from these for possible use somewhere else" projects. This gorgeous butterfly was the first thing I grabbed to rescue from an old card. How could I let it go into the 'round file' ? I reworked the coloring, adding more shading with ProMarkers and some white gel ink highlights to the roses and buds. I added small touches of glitter to the butterfly. I redid the sentiment (same as the one I had used on the original card) and added it to the banner flag shapes, then adhered those behind the butterfly. Everything was then layered onto the brown, die cut, fancy oval (Spellbinders), which was layered onto the lace doily. Everything went onto a square of beige CS which had been textured with my 'Linen' embossing folder and which became the card front. The border at the bottom was cut with a Cheery Lynn border die and backed with white CS. That's a great idea to re-do your cards this way. I need to pull out all mine and do the same thing. The butterfly is totally gorgeous! In fact, I love your entire card Connie. The little banners are a perfect addition too. WOW this is stunning and that butterfly is fabulous! Great save! That is a beautiful butterfly! Thank you for joining us at Brown Sugar Challenges. Great idea to "recycle"old elements into a new card! !Thank you for joining us at Scrapper's delights this month! Love this digi! Thanks for joining us for our weekly Bugaboo Stamps/Catch The Bug Challenges. We hope you'll join us again soon for our newest challenge! 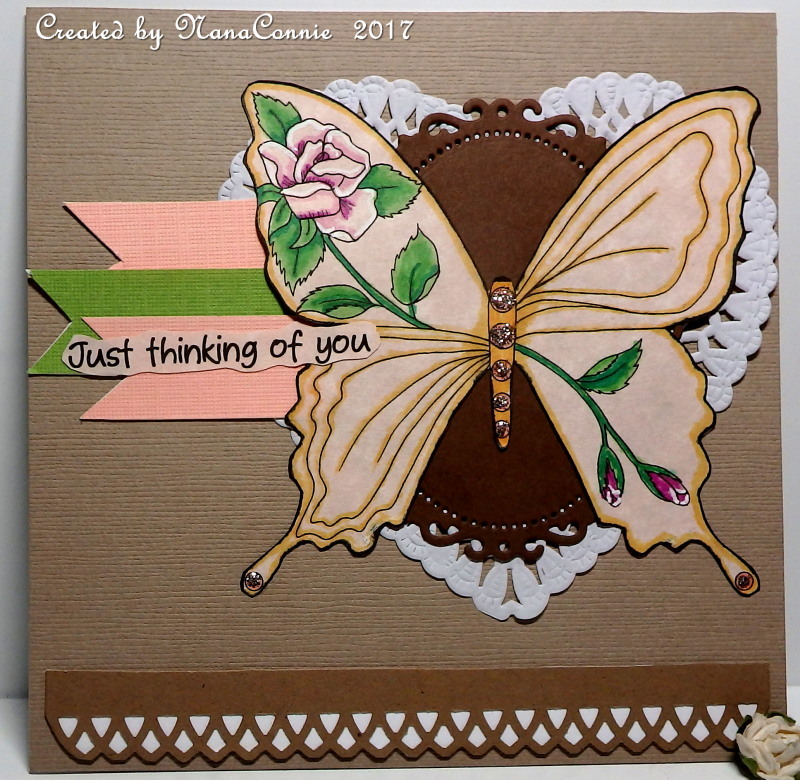 Thanks for popping your lovely entry into our Anything Goes challenge at the Bugaboo Stamps' Catch the Bug blog - good luck! Such a great card... love the colours and the large butterfly. Thanks for joining us at Addicted to Stamps Challenge!